Researchers from the University of Lincoln, UK, have completed a three year investigation into stratospheric passenger airships as part of a multi-national engineering project designed to provide a future sustainable air transport network. Academics from the University’s School of Engineering have been members of a pan European research team that believes airships may be the ‘green’ answer to the future growth of aviation. The Multibody Advanced Airship for Transport (MAAT) project aims to position airships as the solution for future air transportation that is safe, efficient, cheap and environmentally friendly. The EU-funded MAAT project, made up of eight nations and led by the Universita di Modena e Reggio Emilia in Italy, envisages the design of a cruiser which can travel across the globe on a set route. Smaller feeder ships carrying people and goods would then be able to dock onto the cruiser while it is still moving. The primary energy source for the MAAT is through harvesting sunlight from photovoltaic arrays mounted on the upper airship surface to provide sufficient electric power during the day to operate the airship’s systems, and provide life support, propulsion and control, while also producing sufficient excess energy that can be stored to facilitate continuous MAAT operation at night. The University of Lincoln team’s research has focused on how to make the most efficient use of energy generated by the photovoltaic cells on the airships and its subsequent use in the electrical power systems, energy storage and the propulsive power requirements. It is hoped that with the introduction of innovative propulsion systems that the limitations of traditional propellers at high altitudes will be overcome resulting in an efficient propulsive system. A paper detailing the Lincoln group’s initial findings was previously published in the Journal of Aerospace Engineering. The team believes airships represent the best hope for sustainable civil aviation. It described the energy systems and presented various design options that could be adopted for airships, particularly highlighting the issues of day/night operation and its impact on the on-board energy storage systems. The project has moved on significantly since then with a revised approach to the energy harvesting, distribution and storage utilizing a modular approach to simplify future scaling and address system integrity under failure conditions. It is forecast that by 2020 the number of aircraft passengers will reach 400 million. 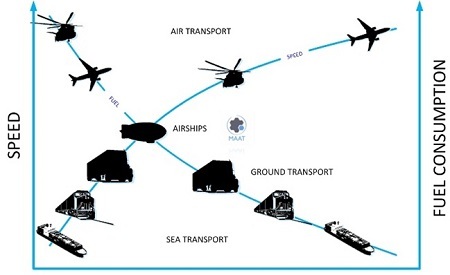 The movement of freight by air is expected to increase by more than 340 per cent over the next 20 years. During the same period congestion at many of the UK’s airports will squeeze out cargo operations because of economic and environmental reasons. Consequently if the market demand for air freight is to be met, either there will have to be significant investment in new airport infrastructure or alternative transport forms need to be considered. It is claimed that MAAT could lead to lower transportation costs than currently existing systems as it does not require fueling and vertical take-offs would reduce delivery times and free-up runway space across the globe. Also, silent landing and take-off operations would reduce the environmental impact of air travel allowing 24-hour operation within busy cities. This entry was posted in Airships, High Altitude Airships, New technology and tagged airship, Multibody Advanced Airship for Transport - MAAT, Universita di Modena e Reggio Emilia, University of Lincoln - UK. Bookmark the permalink.